Pent up emotions can cause physical illness. An imbalance between your Ego and your emotions will cause digestive problems. Resentment and bitterness create negative energies within the body, which can cause inflammation and pain. Stubbornness goes to the knees, shoulders and joints, parts of your body that are meant to be flexible. Arthritis is bottled up hurt and resentment. Cancer is a deep secret, hatred, guilt or grief. Breast and uterine cancer reveals a lack of nurturing or self nurturing in your life, or an inability to nurture others in a healthy way. Back pain reveals a lack of support. Thoracic back pain shows no emotional support or love. Middle back pain is carrying the weight of the past and overwhelmed by responsibility. Pent up emotions can be released through the feet. Take of your shoes and walk barefoot in the grass. Walk along a beach or beside water where negative ions are released into the air by moving water. Soak your feet in epsom salts and hot water or have a Reiki treatment. Smile, even if you don’t feel like it, smiling changes your body chemistry. Laughter is also a great emotional release. Physical exercise, strenuous labour or sports activities help to release and reduce emotional energies harmlessly. Breathe deeply, when you exert yourself you breathe more deeply, getting added oxygen. People who are in emotional or physical pain tend to breathe very shallow. Meditation is an ideal tool as well. Our physical body reacts to what is happening in our emotional and mental bodies, this has been proven by many reputable Doctors and Psychologists who have studied how our emotions impact our immune system, health and well being. I too have studied this fact because of my own experience with illness, and have a positive story to tell. I truly believe in the healing power our Soul offers us through way of the Chakra Energy System, which is Reiki Healing. We can overcome and heal our physical body of illness, of any kind. The key is to get to the underlying (spiritual) ‘root’ cause of the problem. 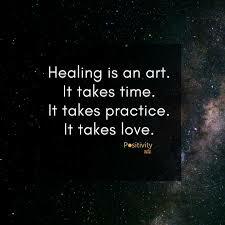 If you are suffering from any illness, whatever it maybe, seek out a Healer, Intuitive Healer, Mentor, Reiki Practitioner, or someone you trust that supports emotional healing, to help you along.